The new Roadmap service is rolling out to tenants in different regions. It will give organizations a ” cross-functional, big picture view of all the work in process “. Roadmap and Project Online’s new Home are the first pieces in Microsoft new project management experience. The new project management experience will be build on Microsoft’s Common Data Service for Apps, which makes this new product super exciting. 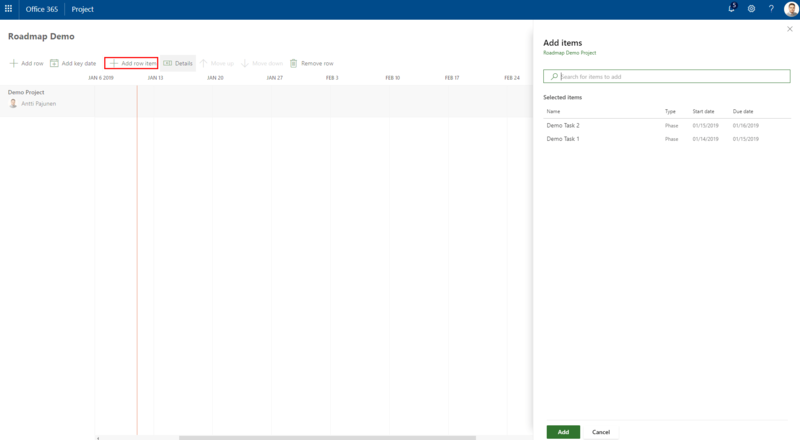 Essentially the new experience means that Project Online and Dynamics 365 for Project Service Automation and their functionality will merge as a new, robust project management tool. While the new experience is still in the future to come, Roadmap is now GA. Let’s take a quick look at how Roadmap is enabled in a tenant, how Project Online projects can be connected to an organization’s Roadmap and what entities Roadmap uses in Common Data Service. For troubleshooting issues around enabling Roadmap and for in-depth information, be sure to check here for a post by Microsoft’s Brian Smith. 1. Turn Roadmap on from Microsoft 365 admin center’s Settings -> Services & add-ins. Choose Project Online and turn Roadmap on. To see Project Online under Services & add-ins, a Project Online license is needed. A Dynamics 365 Customer Engagement Plan license is not enough. At the time of writing this blog post, all organizations we not yet enabled for Roadmap. 2. Navigate to https://project.microsoft.com and create your first Roadmap. It can take a few minutes for everything to be ready on the first go so be patient and give it a couple of minutes. 3. When a new Roadmap is created, projects need to be added to it. I have previously created a couple of POL projects so the next step is to add a new row and connect to a project. 4. A project’s task can be added to the created row by choosing Add row item and by selecting tasks from the related project. 5. A row item’s status can be changed by clicking on the row item and changing its status. Looking at the default CDS environment from web.powerapps.com, we will find a solution named Portfolio Service. This is the solution that contains the six entities used by Roadmap. MVP Paul Mather has an excellent article on Roadmap and its entities so be sure to check it out for additional details. Another section worth investigating are the Flows that will be seen under the default environment, when a project is connected to a Roadmap’s row. In my example, two new Flows have been created based on two projects connected to my Roadmap.